Since I was long overdue for a periodontal cleaning, we thought it would be good idea to check out the cost for dental services in Mexico, or Oaxaca specifically. We asked our AirBNB host if she could recommend a good dentist and she pointed us to the dentist she used for herself and her daughters. The dentist is Cecilia Martinez of Grupo Dental Mena y Martinez, located at Pino Suarez 723 in Oaxaca. Before we went there we checked out several dentist offices that we passed by while out walking. 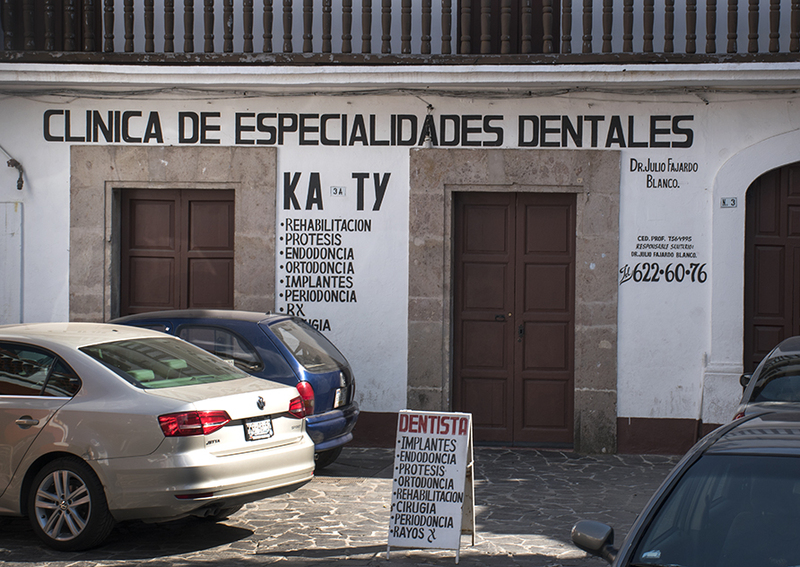 We were actually surprised how many dentist offices we spotted in Oaxaca; many more than you would expect for the population. The appearance of some of these offices would not inspire confidence and the filthy waiting room we encountered in one of them was downright scary. When you choose a dentist you like to think that that cleanliness and sterilization of equipment is a high priority, so walking into a filthy office just doesn’t cut it. Cecilia’s office was spotless and modern. She came out and met us personally and we asked for the price of the periodontal cleaning and were quoted 1000 pesos, about $53. Even though this was higher than all the other places we’d visited, the look of her facilities and Cecilia herself inspired the kind of confidence we were seeking. I asked who would be doing the work and Cecilia said she would do the cleaning. How often would you have a cleaning done in the U.S. by a dentist, let alone an endodontist? Just about never. We scheduled the appointment for the following Monday. The cost for an ultrasonic scaling and deep cleaning back home in Portland, Oregon would run upwards of $400-500 if you walked in off the street with no insurance. On Monday I arrived for my appointment and was ushered into a modern dental theater. Cecilia explained that she didn’t have a lot of English and inquired about my Spanish and I said I thought I would able to understand and respond to most of her directions and questions. I filled out a detailed health questionnaire in Spanish and only had to ask about a few entries. She started out by applying a numbing agent to my gums, which I’d never had done before a cleaning. She then proceeded to do a thorough ultrasonic cleaning for about an hour…by far the most extensive ultrasonic cleaning I’ve ever received. Usually in the past when I’ve gotten periodontal cleanings which included ultrasonic treatment the hygienist only used the ultrasonic wand sparingly. Cecilia worked me over. After the cleaning was finished, she said that she noticed I had areas on three teeth where the enamel was worn through. She asked me had I been experiencing any discomfort when drinking hot or cold liquids and I said I had been for several months. She said I should consider getting those spots repaired. I asked her about the process and what her price would be for doing the work and she said 1200 pesos per tooth. I told her I’d get back to her and later Ger and I tried to find out more online about the process she was suggesting since I hadn’t understood her Spanish that well. It seemed like what she was talking about was sealing and bonding the teeth with a color matched bonding agent. The cost for this process in the U.S. is about $200-800 per tooth. Ger also learned that sometimes dental insurance won’t cover this procedure because if there is no obvious decay it is considered a cosmetic procedure. We returned and asked more questions about the procedure and she showed us the products that she would be using to do the repair and I made an appointment for the work to be done in two sessions a couple days later. The work on the first two teeth went very smoothly and after she was finished she explained that she had a cancellation from her next patient and if I was willing we could take a half hour break and do the other tooth the same day. So that’s what we did. I no longer have any discomfort with hot or cold liquids and the work she did was first rate. I have a difficult time even telling which teeth she worked on. Total cost for the cleaning and fixing the three teeth was just under $250. In the U.S. the cost would have been $1000-1600 or more. Another problem I was having was with my eyeglasses. I had brought my flimsy pair of progressive reading glasses and another sturdier pair with an older prescription which weren’t great. I use these mainly for close up work, working at the computer or reading. In addition I have a pair of progressive sunglasses that work for distance vision as well. In San Cristobal I had been having problems with the frames on the sturdier pair of glasses and one day one of the lenses popped out and I didn’t notice it until we got home. We went searching but never found it. So I started using my flimsy pair, but the frame broke and I was using it with tape to hold it together. In Puerto Escondido I lost this pair. I think they fell out of my camera bag when I was fishing my camera out, probably on the beach somewhere. So I arrived in Oaxaca without a pair of close-up glasses which makes it very difficult for me to use my computer. Ger and I went in search of a pair of cheater reading glasses and found a pair at an optical shop named Optica Vic for $5. While there we asked about what it would cost for an eye exam and a new pair of single-vision reading glasses. We were quoted 1000 pesos ($53 again) for the exam, lenses and frames. After a couple days using the cheaters, I felt that they weren’t good enough to use for long periods of time, so I went back to Optica Vic to get a prescription pair. The exam was very quick and included only evaluating my vision prescription, no checks for glaucoma and certainly no consideration of astigmatism. In the end I ended up with a serviceable pair of reading glasses that work well enough for me to use them for long hours at my computer as well as up closer when reading my iPad. In addition, just prior to going to Optica Vic one of the screw heads in the frame of my nice prescription sunglasses broke and they fixed it for me for free. A week later the screw on the other side broke and I want back to them again and he fixed it for 20 pesos. So how would I rate my experiences having dental work done in Oaxaca? I’d say easily as good or better than dental work I’ve had done back home for one fourth or less the cost. I would suggest to anyone considering going to Mexico to get dental work that you get recommendations from locals if you can or at least try to find reviews of the dentist. Also, I’d consider the kind of work you are having done. If you are getting a procedure that has some risk that you might need to return to the dentist for revisions or corrections, such as dental implants or bridges, I think I’d be reluctant to have that kind of work done in Mexico, unless you plan to be staying there for quite a while. If you have problems later you can’t just pop back into the dental office for a fix if the office is a couple thousand miles away. Also, don’t try to lowball the costs too much. Even in Mexico the better dentists charge more. However, you can find top quality dentists who will still be substantially cheaper than you can find in the U.S. Another thing you need to be concerned about is your ability to communicate with the dentist. My dentist spoke some English and I speak enough Spanish that I didn’t have much problem understanding what she wanted me to do or what she planned to do. If I had no Spanish it wouldn’t have been as easy. So, if you don’t have Spanish language skills, you will need to look for a dentist with decent English. With regards to having eyeglasses made in Mexico, the lowest cost for similar polycarbonate glasses in the U.S. including an exam would be $160-200 using Costco for the exam and the least expensive option for glasses, such as Warby Parker mail order glasses. Having them done at a brick and mortar vision center would cost much more. So my reading glasses were a great deal at about one fourth the price. 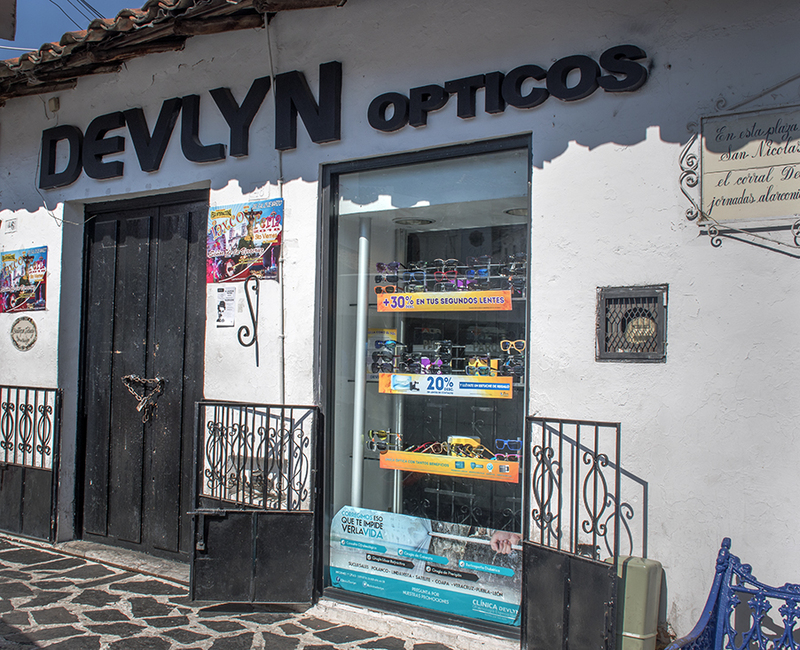 There were so many optical shops in Oaxaca we couldn’t believe it. It seemed like there was one every couple blocks. Many of them seemed to be run by people who didn’t really know much, or they were offering glasses at really low prices which we found out later was because they made their lenses from soft sub-standard plastics. By shopping around and asking questions in different shops we were able to find one that was staffed by competent people and which sold good quality lenses. 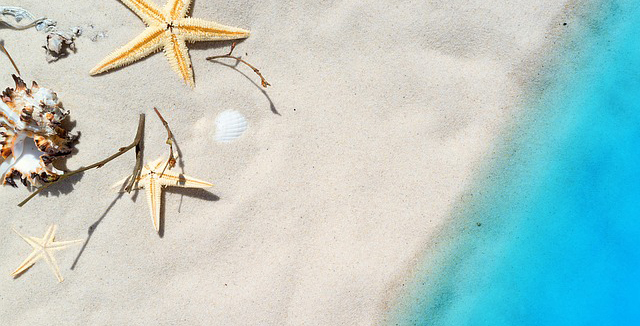 love reading your blogs even if I think ouch …dentist… on holiday..